We are so excited to have had Masterchef Junior Jimmy visit Gregory Family Child Care in Valencia this week. If you are not familiar with Masterchef Junior, it’s a wonderful Fox Reality TV show where young talented home cooks compete in cooking challenges with the winner earning the title of Masterchef Junior. When I watched the first episode this season I was excited to learn we have one of our hometown boys in the competition. I then friended Jimmy and his mom on Facebook and discovered we kind of made a connection! From there, I met Jimmy’s mom in person at a local Starbucks and later arranged to have Jimmy visit our child care here at Mary’s Schoolhouse in Valencia. Wow, what a busy week! We had a special Valentine’s Day party on Thursday, and Jimmy visited on Friday. 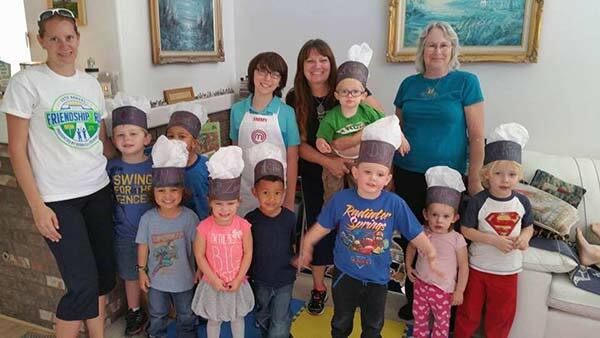 The children and teachers were thrilled to have Santa Clarita’s talented young Masterchef Junior contender visit our home child care! In advance of Jimmy’s visit, everyday we played small portions of the Masterchef Junior TV show so the children could see Jimmy cooking on television. Then, for one of our craft projects we helped the children make chef’s hats to wear on our Masterchef Junior day. As usual, we used this special event as a way to stimulate the children and make learning fun! It was also an opportunity to teach the kids some basic cooking skills. I must say, this experience with Jimmy was amazing. Jimmy really seemed to have a fun time here with the children. He arrived with special treats, read a story book, answered questions, signed pictures and the children really took a natural liking to him. Even our teachers seemed a bit star struck, but they managed to focus on their jobs and keeping the visit organized. Jimmy is an amazing young teen and a wonderful role model for youngsters everywhere, especially here in Santa Clarita Valley. Being a young teen himself, Jimmy’s mom Lisa was here as well and it’s not surprising she’s an amazing and supportive mom herself. Talking about inspiration, it now appears our 7 year old granddaughter Gianna has been inspired by Jimmy to learn even more about cooking! We hope you enjoyed our exciting news about Masterchef Junior Jimmy Visits Gregory Family Child Care.